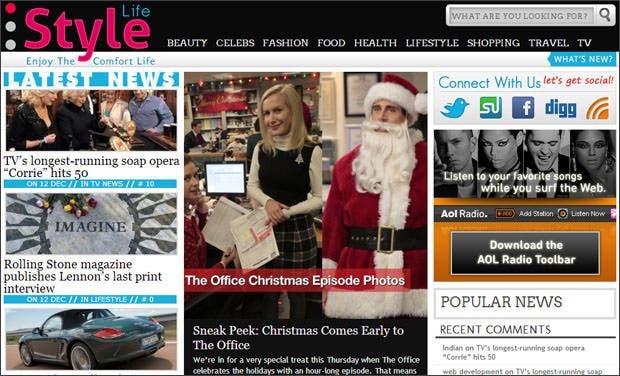 Planning to start your very own Online Magazine, or trying to take your prints online? 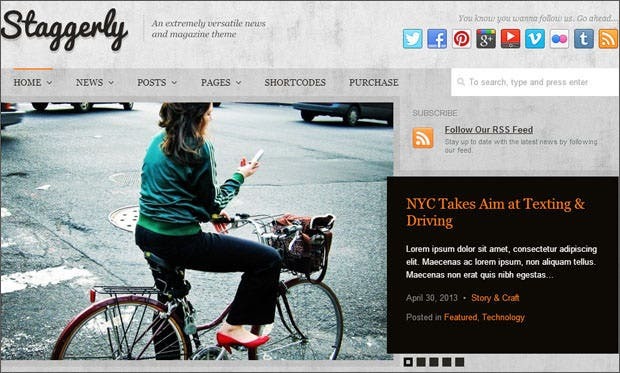 Well, before you invest a fortune in building such sites, consider using Magazine Style WordPress Templates. 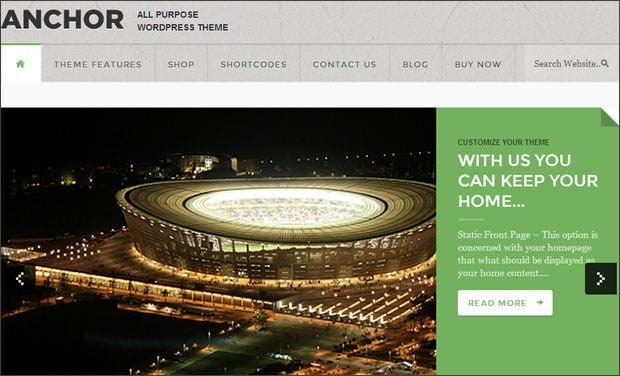 These well designed themes will help you setup a website, all on your own, without requiring even a single line of coding. And can also provide you with even better functionalities than traditionally coded websites. 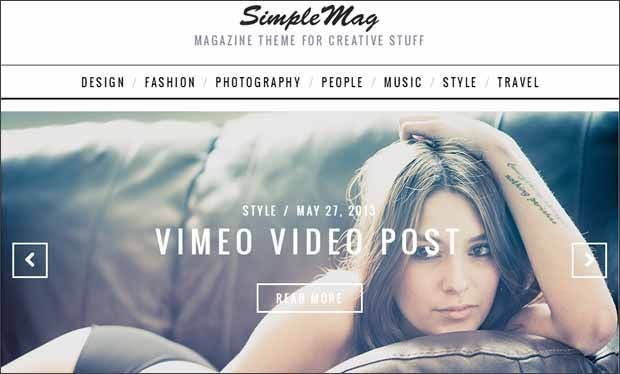 So here is a list of the Best Magazine Style WordPress Templates for you to choose from. 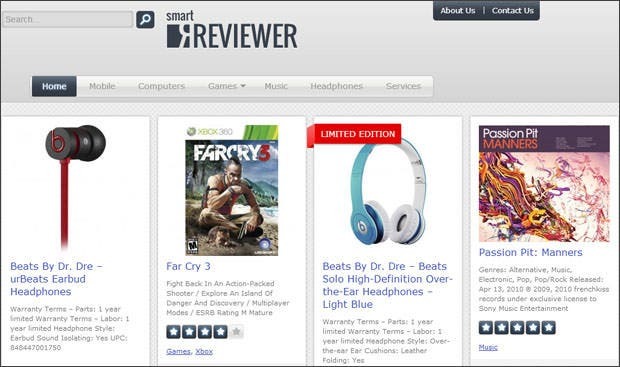 The template features a Taqyeem review plugin that will enable your visitors to rate and review your magazine posts online. The elegant and professional design of the template make it ideal for users looking to create a full-fledged magazine themed website. Packed with all the essential features required for a fully functional magazine website, the template even has its very own review system. The template design includes separate widget sections for ad management which enable you to easily add new ads on your website. Get interactive with your visitors by adding Google analytics, favicon, jQuery powered comment sections an much more using this amazingly designed magazine wordpress template. 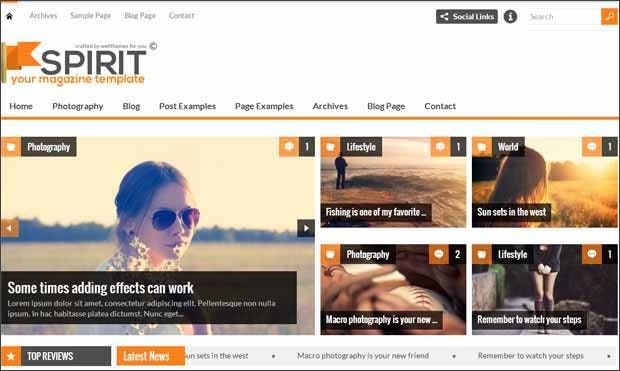 Ideally suited for health and lifestyle online magazines – the template offers full backend support for your readers to comment and post on your site. 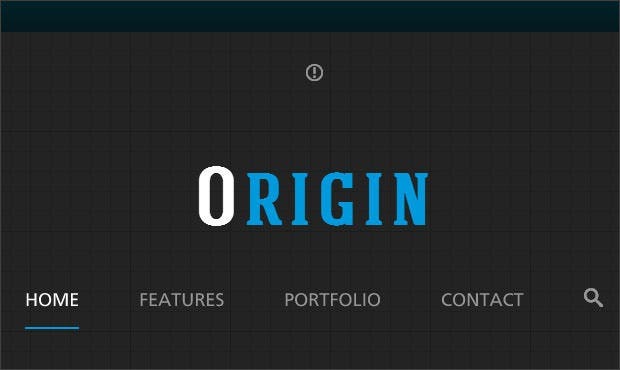 The unique design layout of the template and the 6 different customizable homepage layout options ensure that you have maximum control over the design of the template. The template offers complete cross browser compatibility and also features a responsive design that make sure your visitors have no trouble accessing your site. Highly optimized for mobile platforms the magazine template includes a 5* Kodda mega menu that enables you to easily customize the menu layout of your site. The stand-out design of the template combined with interesting features such as the trending topics slider provide you the perfect platform for setting up a highly professional magazine website. 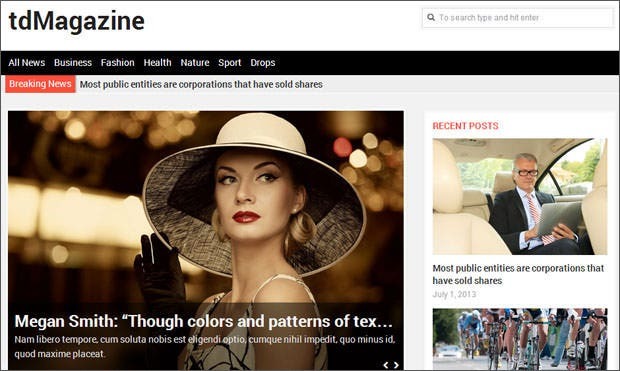 Impress your readers at first sight by creating the perfect homepage layout using the customization options provided by this magazine template. 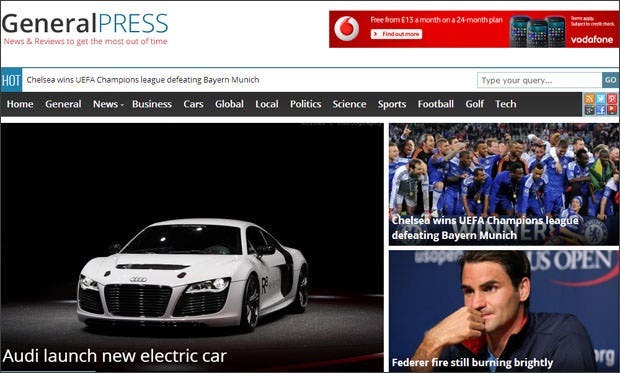 Inspired from the popular metro theme the template comes with a unique Ajax Load more feature that enables your readers to read all posts on a single page. The template includes a custom admin panel that allows you to etch your own logo or header layout on your magazine website. Maintain both your magazine blog and your business with this amazingly designed, Woocommerce ready magazine wordpress template. The template has complete social media integration and also provides a mega menu widget which enables your customers to easily navigate through your site. Make navigation through your website easy with this schema search powered magazine wordpress template. The design also includes 30+ shortcodes for easy modifications. The template offers 4 different color schemes for the background despite its minimalist design, and also has complete woocommerce integration. The template features an off-canvas navigation option that makes it easier for mobile user to use to your website no matter how small the screen resolution maybe. 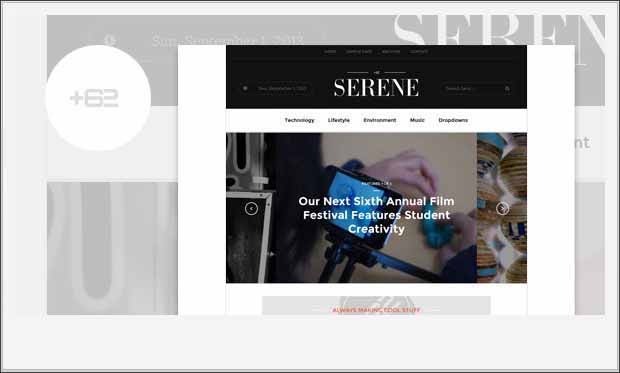 The lightweight design and the mobile responsive features of the template makes it ideal for creating magazine sites for smaller screen resolutions. 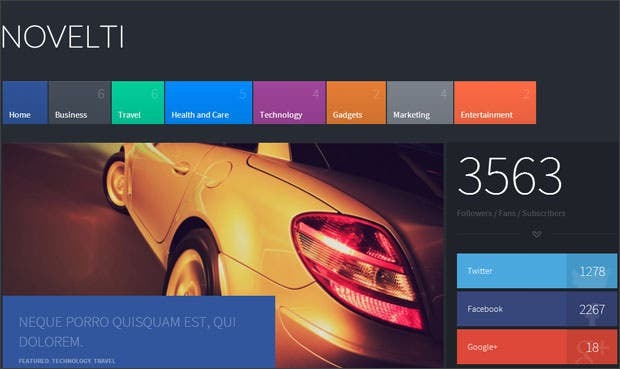 Add color to your online magazine posts with this highly customizable wordpress template. Choose from unlimited color schemes for your background and switch between hundreds of Google fonts using this template. 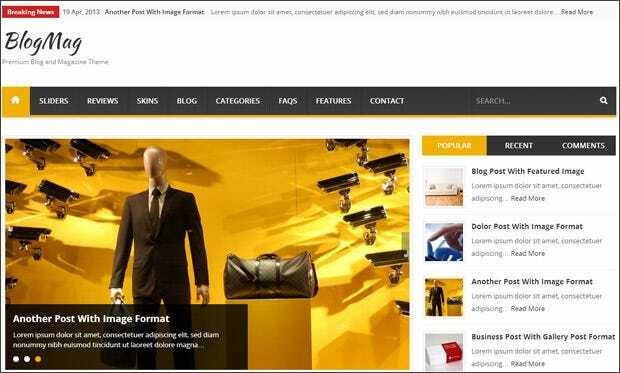 The layout options provided by the template enable you to choose from either a traditional fashion mag style layout or a simpler blog style layout. The template allows the users to add sidebars on any position in the page and also includes 18 different widgets to be used in the design. 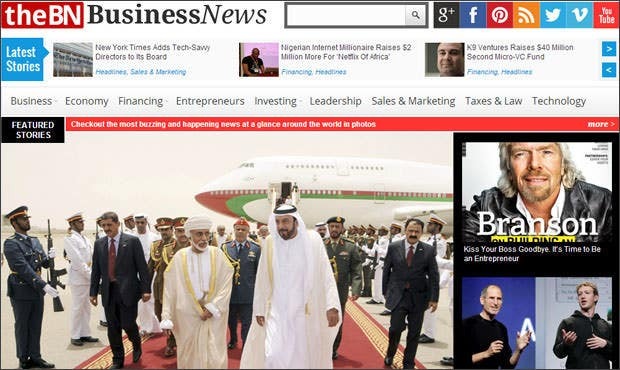 The professional and minimalist design makes this magazine template ideal for use in financial news websites and political related news websites. 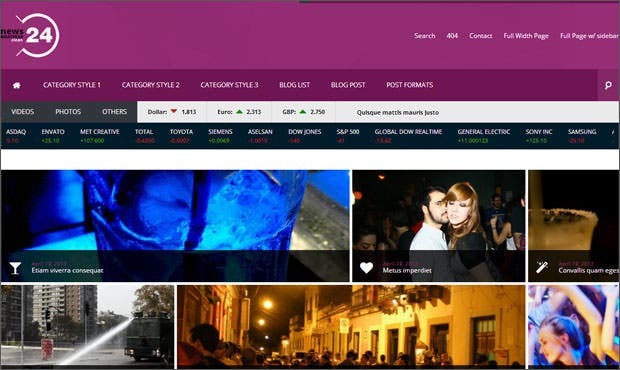 The template features the unique metro style layout with posts aligned in grids. The template also includes a Google Maps plugin. The unique design of the template that combines the features of portfolio grids and magazine text boxes ensure to provide your website a refreshing look. The mobile friendly design features and the blog post filtering options provided by the template make it ideal for large magazine websites. 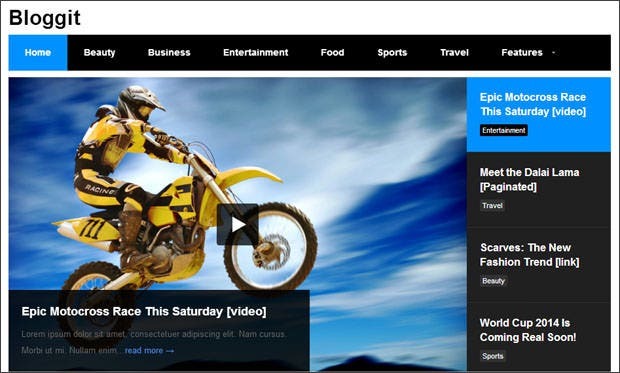 The magazine template features a compact and clean design and has an inbuilt video player that supports all video formats. 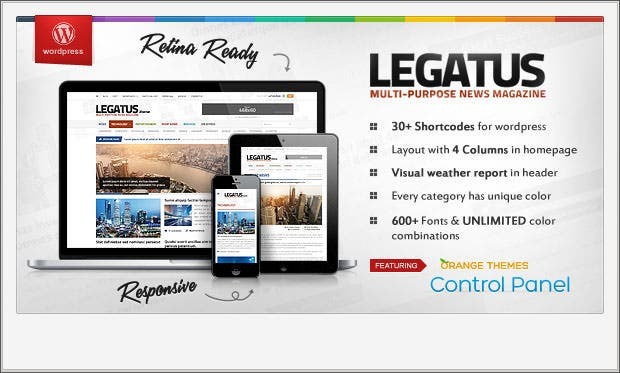 The widget ready template provides the user complete control over the design of the magazine layout of the template with its powerful admin panel. The template features a central, full width homepage slider which can be effectively used to display your latest posts on your website. 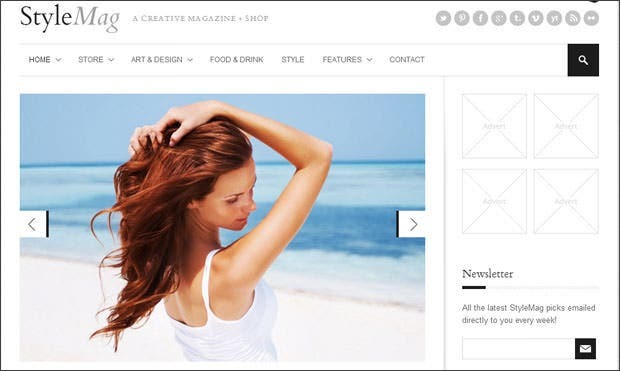 The rich typography and the unique creative design ensure to provide the perfect blend of style and functionality to your magazine website. 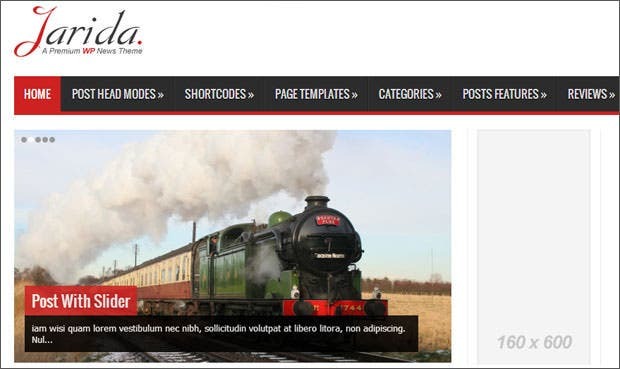 The template enables the user to integrate unlimited sidebars into the webpage and also choose from infinite color options for the background. The premium magazine template includes a WPML translation ready widget that enables you to easily convert your website to any language. 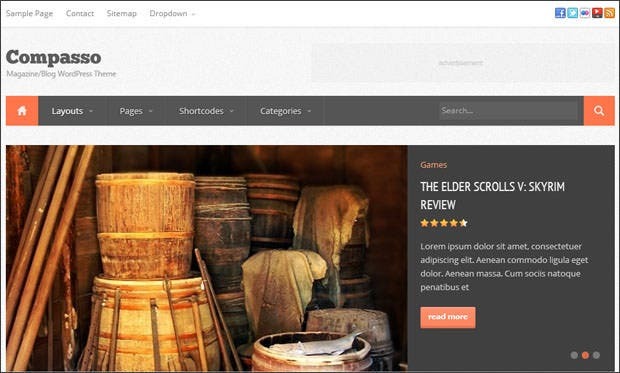 The template features an attractive accordion menu and a AJAX powered search option that enables your users to effectively navigate through the content. The design of the magazine template has been made with novice wordpress users in mind, making it very easy to use and maintain. The unique black and white retro design and the use of Google Web fonts of this magazine template work well to impress your visitors at first sight. 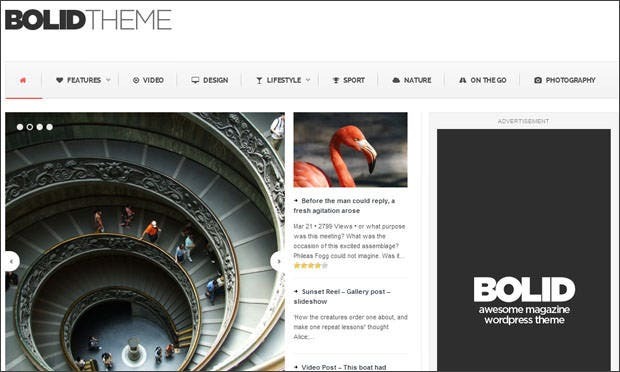 Designed with the AIR framework, this magazine template ensures fast loading on all browsers and operating systems. It also includes a social icon links module. 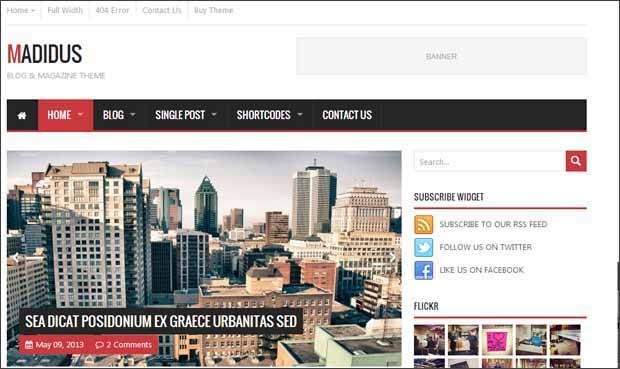 Powered with Bootstrap this ultra-responsive wordpress magazine template provides the user plenty of customization option with its 30+ shortcodes as well. The bold design and the custom home page layout of the magazine template ensure to reflect the characteristic that the title beholds on the website. The template features a full width homepage slider that can be effectively used for displaying the latest topics on your website. The template provides the ideal setting for creating casual blog styled magazines with its customizable home page layouts and widget optimizations. 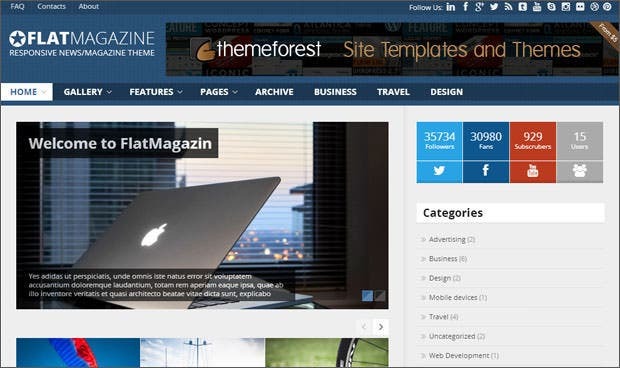 The template provides a complete solution for your magazine website need. Right from Minisite page builder to Woocommerce integration, the template has everything you need. The template comes inbuilt with a data import option that enables you to import content and media from your previous websites easily. Ideally suited for health, lifestyles, food and home decoration type of online magazines, the coding of the template even includes SEO optimization. The design of the template has been ideally optimized for technology and science related magazines with it classic white background layout. 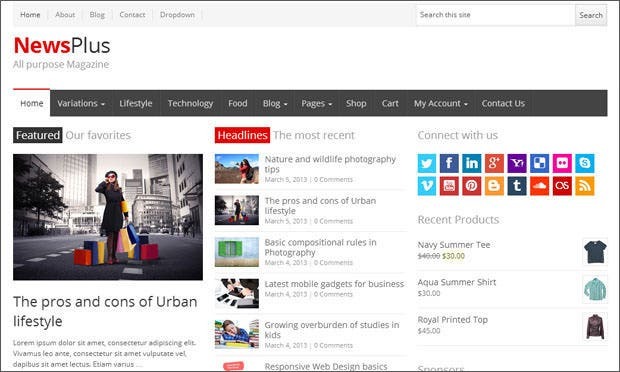 Looking to go beyond the traditional magazine websites? 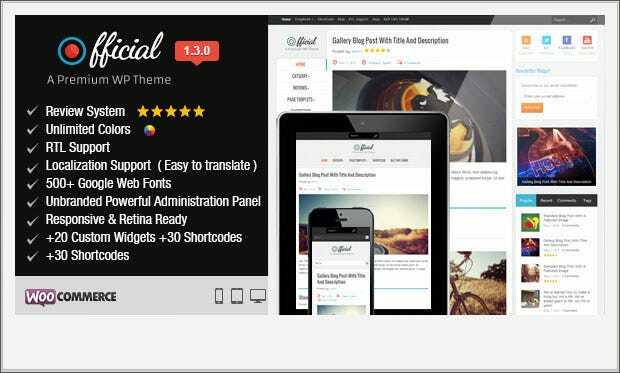 Well, then this wordpress template with its ad management features is the perfect theme for you. With its translation ready features and RTL support, the magazine template sure has a reason to be named Worldwide. 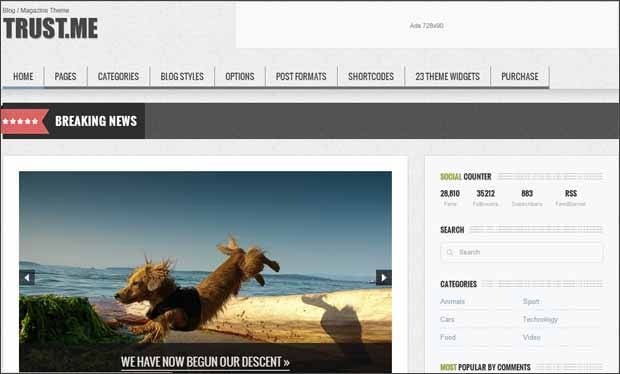 The layout of the template has been designed to look peppy and attractive making it ideal for media content heavy fashion websites. 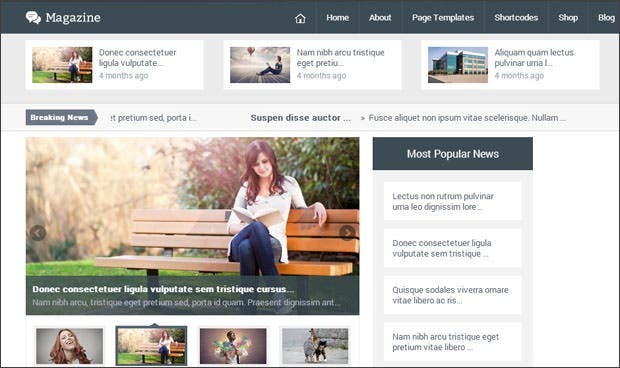 The template features a masonry tile layout and also allows the user to manage sidebars and theme layout from the admin panel. Coded with HTML5 and CSS3, the magazine template enables the user to customize the layout of the website easily and also allows them to choose from 26 custom widgets. 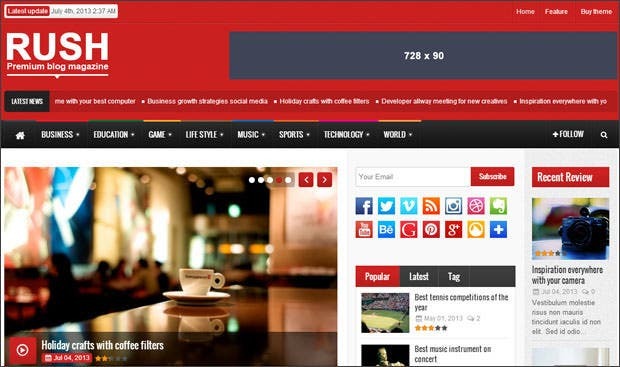 Get interactive with your readers with this buddypress enabled magazine template. 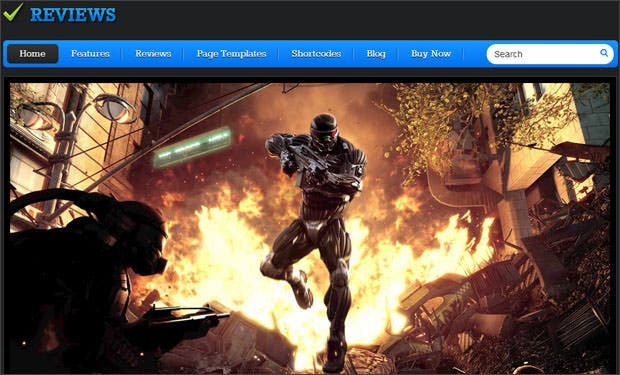 The theme also includes a fully functional page builder visual composer. Create your dream magazine website easily using the flexible drag and drop options provided by this amazingly designed template. The SEO optimization option and the Woocommerce and social media integration provided with the template ensure that your site attracts the maximum visitors. 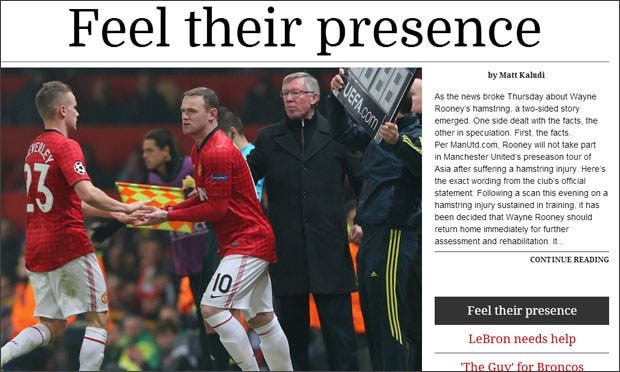 Have no limits to where your magazine can reach with this translation ready, RTL powered wordpress magazine template. 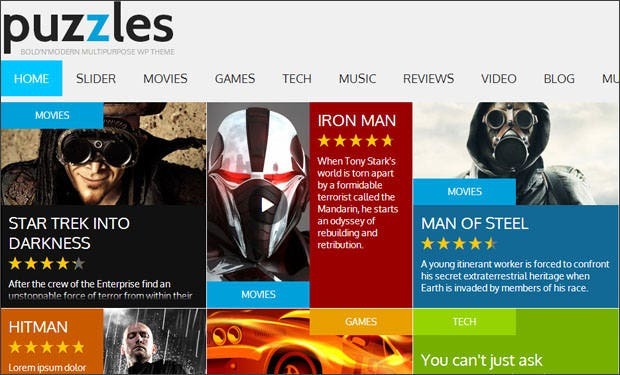 Mold the website anyway you please with the powerful admin panel that accompanies this magazine template. The template is also Adsense ready. The template comes with a unique page builder that enables you to modify the design layout of the magazine theme anyway you please. Built upon the powerful ST framework, the magazine template provides full language support with its included stTranslator plugin feature. The template is completely compatible with the latest version of wordpress and also provides complete cross browser compatibility. 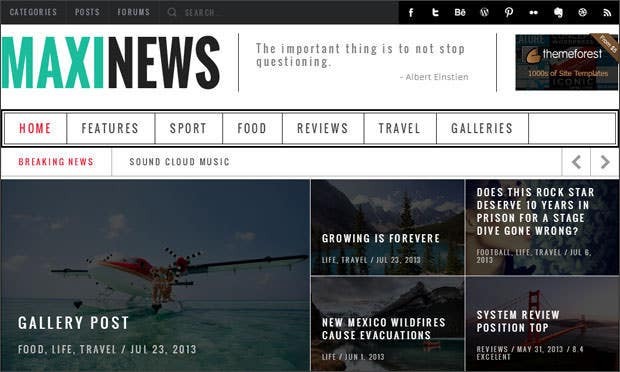 Get creative with the way you present your news with this uniquely designed magazine template. 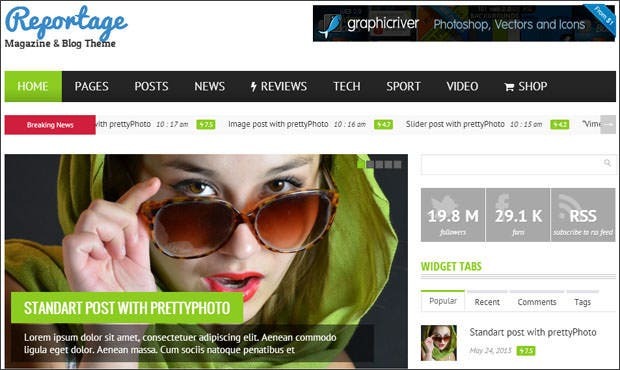 The theme is fully responsive and works well on retina display as well. Choose from two different layouts for your homepage, either full width or box width, using this creatively styled magazine template. The template provides ample customization options and allows users to choose from unlimited colors and fonts for the design layout of the website. Ideally suited for sports magazine websites, the template includes a lightbox gallery view feature and 2 level, header navigation. With hundreds of shortcodes and an included shortcode generator, the template serves perfectly for those who wish to play around with the coding a little. Enjoy complete customization with the unique color scheme options provided by this beautifully designed magazine template. It even has localization support. The neat and elegant layout of the template combined with the language ready features provides the basic setting for a hassle-free magazine website. The elegant design with the dual tone color scheme and the neat typography sets a rich background for this magazine styled template. 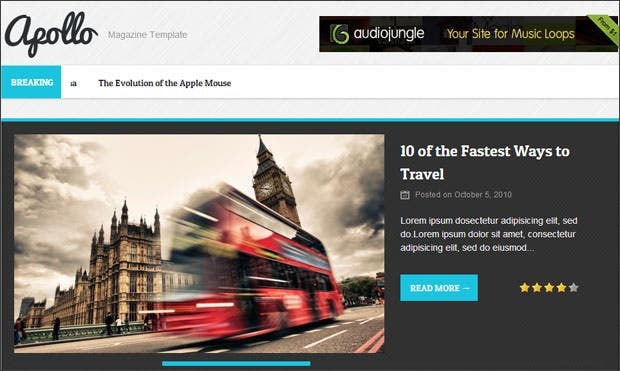 The template offers two separate homepage layouts and 7 different custom widgets for setting up a highly unique magazine website. 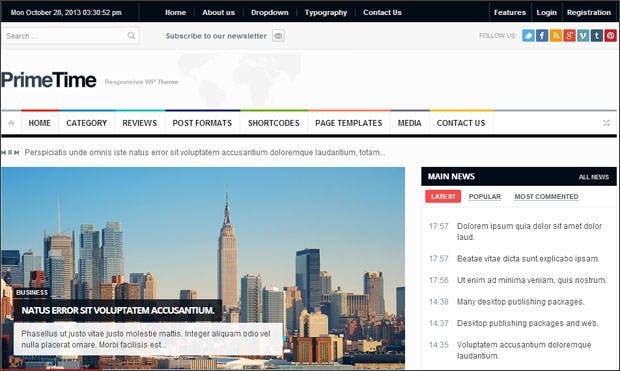 This beautifully designed wordpress magazine template features, as the name suggests, a column styled post layout that works really well on smaller screen resolutions. The minimalist design effect combined with the sharp typography and menu layout enables you to get to the point with your readers instantly. 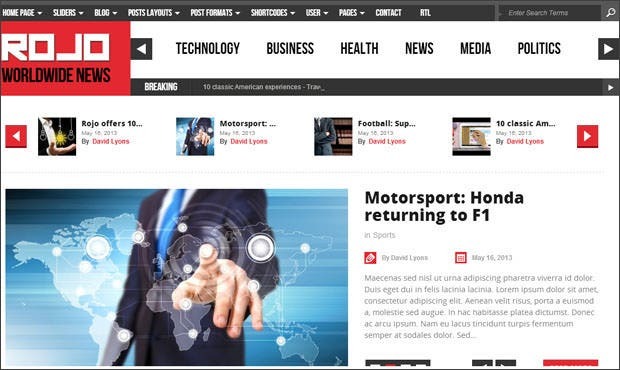 This professionally designed magazine template is ideally suited for sports magazines. 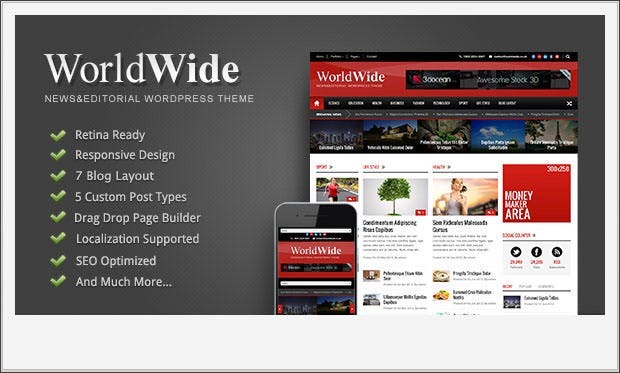 The theme offers complete localization support and maximum customizability. The template includes an advertising manager and drag and drop page builder that enables you to easily create the perfect magazine template of your dreams. The design of the template that includes multilayer content filtering and SEO friendly coding makes it ideal for large, content heavy magazine websites. The simple yet elegant design of the template combined with the SEO ready features make it ideal for starting off with an instant magazine website. 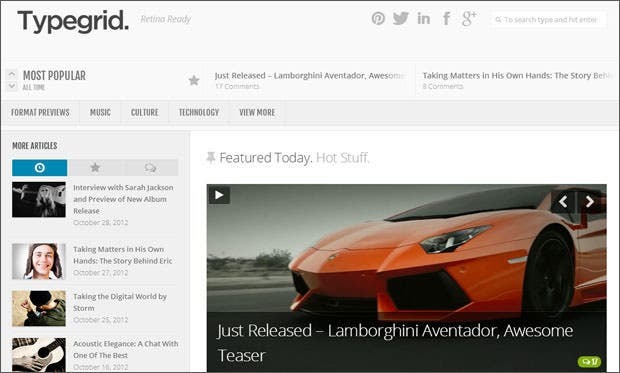 Apart from the essential functionalities the template also includes a Breaking news plugin that enables you to scroll important news on the landing page. 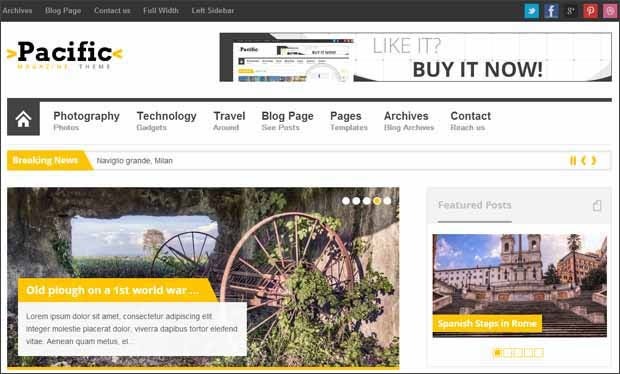 The template enables the user to switch between a professional newspaper style layout and a blog layout depending upon the needs of the user. 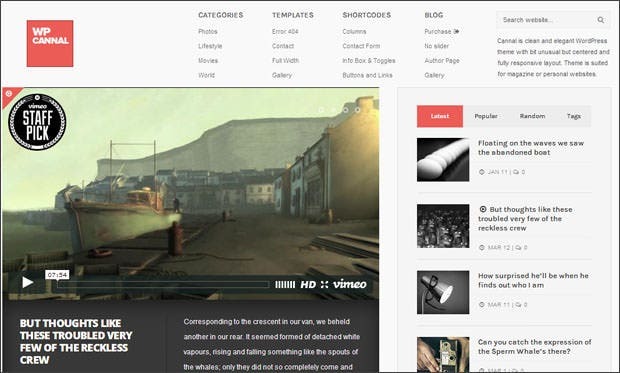 Created with the sole intention of enabling users to easily read through the content, the template also offers loads of customization options for the layout as well. Built with the Twitter Bootstrap framework the template features clean and well commented coding that enables you to easily modify the layout of the template. 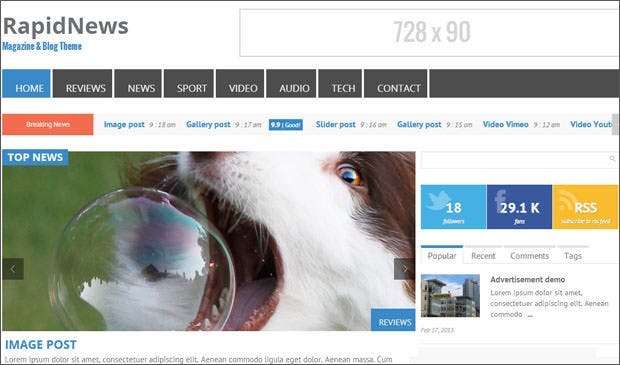 The template despite its unique customization features provides complete cross browser compatibility that allows the website to be viewed without loss of data on any browser. The template has a built in review system and a comments section that enables users to express what they think about your posts on the site. The template features a four column layout allowing the user to pack in as much information as possible. It also has its very own live weather widget. 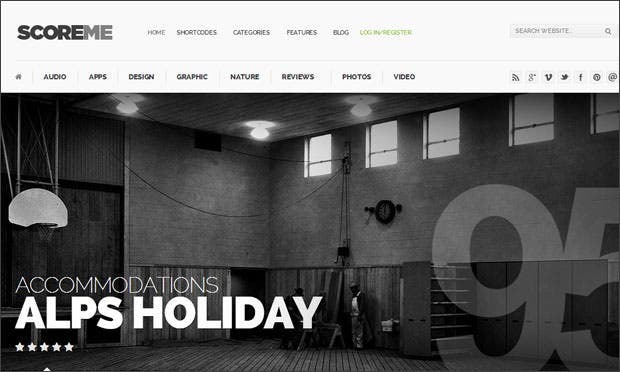 The professionally designed layout with its vision friendly color schemes make it ideal for text content heavy magazine styled websites. Build your very own unique homepage with simple drag and drop options provided with the homepage builder feature of this magazine template. 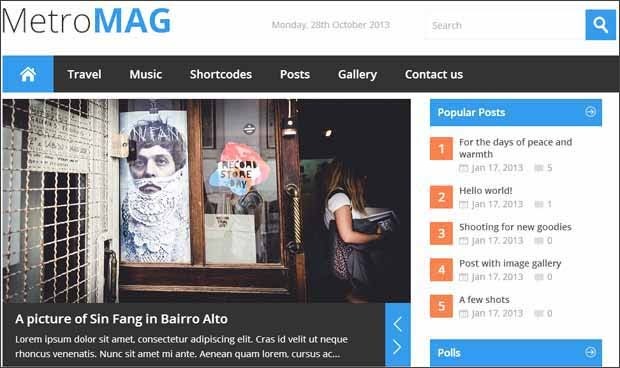 Choose from 6 different clean homepage layouts for your magazine website and even add RTL localization support using this magazine wordpress template. 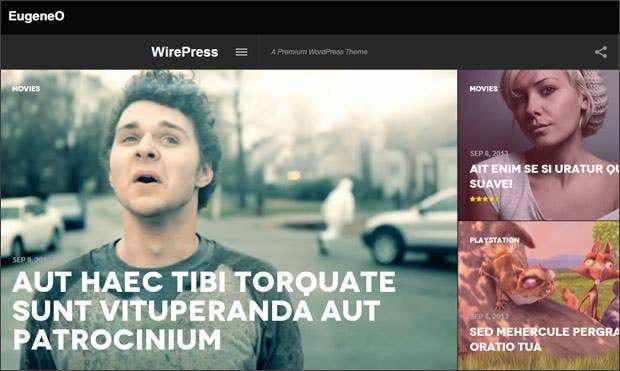 Add unlimited sidebars, choose from 500+ Google fonts and create widgets anywhere you please using this highly flexible magazine themed wordpress template. Despite its design heavy features and the full width 1180px layout, the template still resizes perfectly on smaller resolutions providing a seamless display. 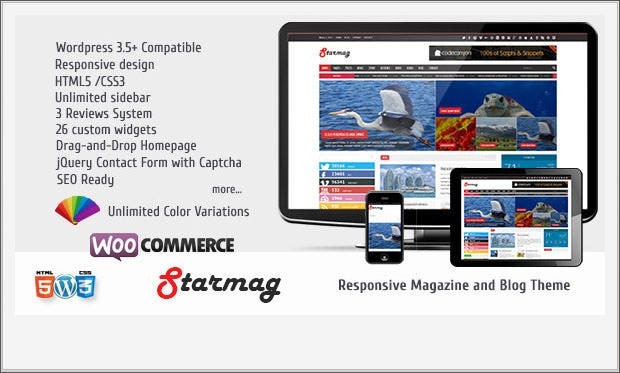 The HTML5 and CSS3 coding included in this magazine template allow easy layout customizations. The template also includes an AJAX contact form. Optimize your magazine website for easy mobile viewing with this elegantly designed one page wordpress template. The template also includes a sketch board panel for backend control. The template provides the perfect transition between a blog and full blown magazine website with its amazing design features and customization options. 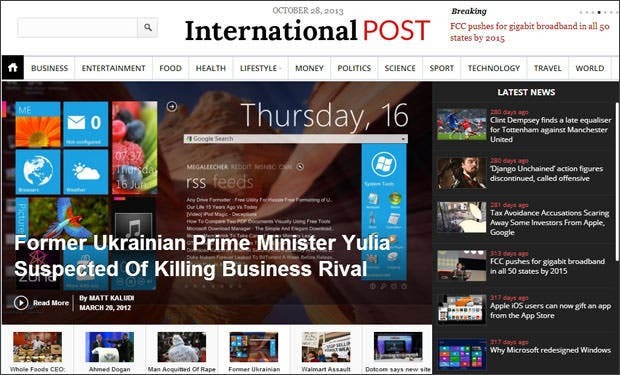 Use the localization support provided by the .mo/.po files included in the magazine template to optimize your website for international readers. The template comes loaded with custom widgets such as photostream, Videoslider and Popular posts that enable you to set up shop instantly. 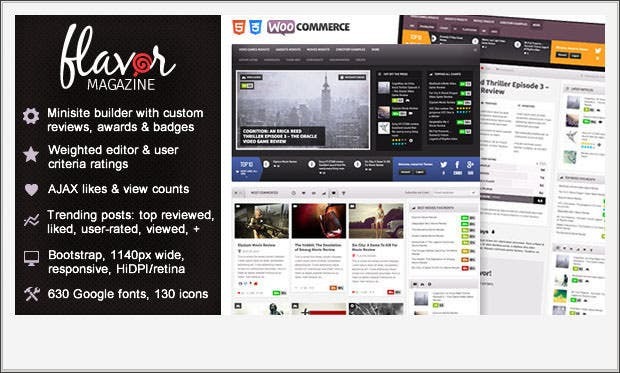 The full screen layout of the magazine template provides exciting options of home page customization; the template even includes a like button. 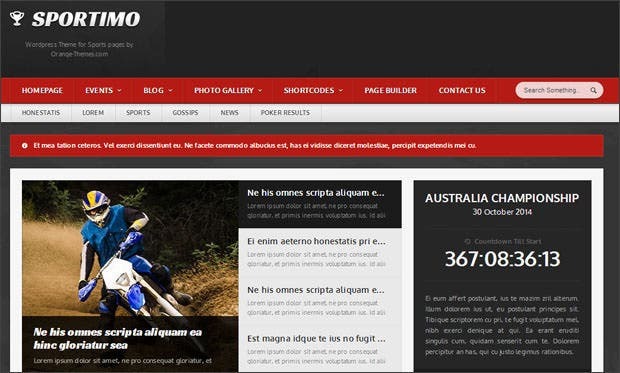 Inspired with the metro tile layout design, the theme offers the user complete control over the design with unlimited sidebar addition and different homepage layout options. 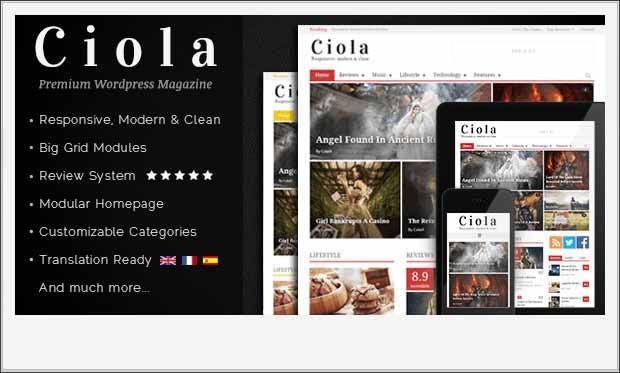 The unique design of the template characterized by the handmade paper background ensures to provide a refreshing look to your magazine site. The template provides plenty of easy shortcodes that enable the user to easily work around the layout structuring of the template. 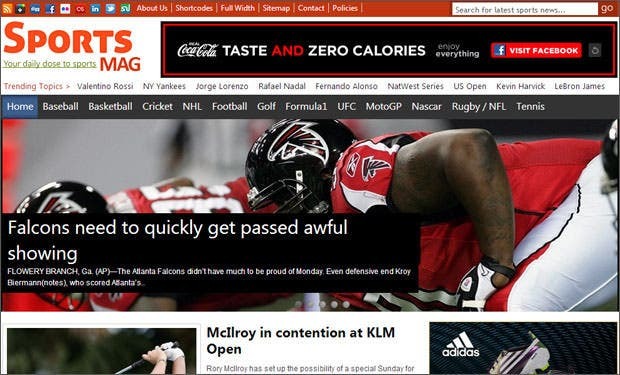 The layout of the template has been optimized to include ad banners and ad sense text widgets on the homepage, making it ideal for professional sports magazines. The template allows you to connect with your readers on a whole new level with its integrated review reply system and Buddypress plugin.